Anyone thinking of getting a pig please visit our sanctuary first as part of your research, you need to be able to look after a pig for a long time, the life span of a pig is between 10-20 years. They are the 4th most intelligent animal on earth. Please do your research in advance, if you are told from a breeder that a pig only grows as big as a Labrador please take into account that a pig also grows wider, longer and stronger than a Labrador and in a lot of cases bigger in height. Please remember ‘A Micro-pig is a piglet, then it grows’. CPH Number & Herd Mark which you can obtain from the Rural Payments Agency (RPA) Telephone 03000 200 301 (without this in place a pig cannot be moved). At least 0.5 acre of land and housing outside (a pig arc or shed). Register with a farm vet. Hard Standing for the pig to walk on to keep their trotters trimmed. Mud area to wallow in the Summer months. Food, grass to graze, pig nuts, fresh fruit and vegetables. Medical costs, worming every 6 months, pest control, injury, infection etc. Grooming, regular trotter trims if not by you, by your local farm vet, oil to keep their skin moisturised, pigs do have naturally dry skin. Regular exercise to avoid obesity and joint dysfunction. 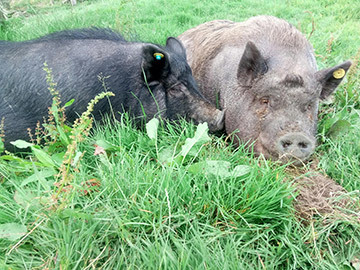 A re-homing check will be carried out prior to the pigs being delivered, if we feel your outside space is not suitable then your request for re-homing will be declined. The European Parliament and the council of the European Union have put in place regulations that it is now illegal to sell or buy red eared sliders and yellow bellied terrapins.